Share your personal, first-person testimonial video to tell New York and its leaders why the cultural heritage of the city matters. Tell stories of your favorite small businesses–and what it’s like to watch the fabric of the city vanish day after day. Share your ideas. Tell the mayor what needs to change–before it’s too late. To make a video, just use your smartphone or point-and-shoot camera in movie mode. Or your laptop’s camera. It’s easy and takes just 5 minutes. Here’s a how-to on filming with your iPhone (horizontal is best), and another on how to upload directly from iPhone/iPad to Youtube. To upload a video, you need a valid YouTube/Google account. To create an account, follow the instructions at www.youtube.com/create_account. Here’s a video on how to upload to Youtube. If you’re shy, wear a disguise or use puppets. 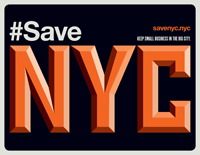 Put a sign over your face that says #SaveNYC. We don’t care. Just please follow the guidelines. Submit short films, documentaries, collages, music videos, etc. Please follow the above guidelines, upload your video to YouTube, and then fill out the fields below. We will review your submission and, if approved, will post it on this site. In order to upload your video, you must have a valid YOUTUBE ACCOUNT. Clear sound is crucial. If no one can hear it, no one will watch it. Make sure to shoot in quiet environments and project. Don't backlight. Make sure light is on your face and not behind it — i.e. don't sit in front of a bright window. Title and tag your video. Use the title "SaveNYC" and include your name and location - ex: "SaveNYC: Dan in Brooklyn".